latest news: St. Martin goose is coming soon!!! The tradition of rowing in Berlin dates back to the late 1870s. 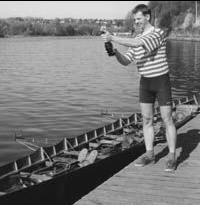 After first clubs were founded and with the first boats being built under English boatbuilders' advice in Berlin rowing developed fast during the 1890s. Until world war one clubs spread like mushrooms in Berlin. Tour rowing developed fast and the surrounding waterways of Berlin were explored. In the 1920s Tour Rowing was a very popular weekend activity. It is reported that tour rowers made day trips of up to 100km and on rivers with current even more. It was common to row longer tours with a tent on board same as staying in on of the numerous boathouses over the weekend with the family. Berlin Classic Rowing offers to experience traditional tour rowing following the old trips in historic boats. Bringing a boat collection to a new life! The beginning: During cold winter 1990 Thilo Scholz got the opportunity to purchase the wreck of an old coxed double four touring boat. The boat suffered outside storage for several years already, roofed only by another already fully rotten four. The outriggers were digged out of a hill in the backyard of the boatshed. Together with the mater carpenter Joachim Reich the boat was fully restored within a period of 16 month of intensive work. Since then it has seen thousands of kilometres on rivers and lakes in all parts of Germany. This four was followed by other historic boats built from the 1880s to the 1930s. Today we have a unique collection of far more than 50 historic sports rowing boats. From the beginnings a small community was set practising classical tour rowing in its best sense in historic boats. With refounding the old Berlin Club "Berliner Rudergesellschaft Elektra" we now have the platform to further develop classical tour rowing. We welcome all rowers interested in vintage boats and shells to join our tours and work with us. Our most recent acquisition, the coxed double four "Rautgundis"
Boat: 4x+ Halbausleger. Built by Lürssen ca. 1920. Trip: Ca. 38 km 1 lock. tour from Nysted to Faxe. Boats: 4+ and 2+ Inrigger. Danish Boatbuilders. Trip: Ca. 150 km no lock. The adequate repair of woodden oars will be shown. The necessary tools and their use will be explained. During the training sessions blades and handles will be repaired or exchanged. The professional use of various types of boat varnishes and oils. The use of blades, abrasive materials and varnish removers to prepare for varnishing will be discussed, presented and demonstrated. Varnishing with old style one component varnishes as well as with modern artificial resin based yacht paints will be practised. Deutscher Ruderverband News from rowing mainly in Germany. Official web page of German Rowing Association. Neusser Ruderverein The web pages of Neusser Ruderverein rowing on the river Rhine. Rudergesellschaft Benrath The pages of RG Benrath in Düsseldorf am Rhein. Greifswalder Ruderclub Hilda Rowing in Greifswald in the northeast of Germany. Sehestedter Naturfarben Paints and varnishes to historic receipes that work.